Food memories are the best memories. They stand in one’s mind vividly and pronounced. Never to be forgotten. As someone with a horrible memory, these food memories are extra special to me. The earliest ones that come to mind are of my mother cooking our family dinners. Traditional Mexican meals that could feed a small village, but was intended for our small family of three. Humble and simple food, yet absolutely perfect and mouth-watering. The flavors still linger in my mind and in my heart. To this day, no on can replicate the taste and quality of her food because the memories they’re tied to can never be replicated. My life is a film reel of food memories. Each significant milestone in the journey has been marked by the flavor and taste of something meaningful. A friend at graduation smashing confetti filled eggs over our heads, weekly “Tea Time” in my college dorm room where friends would gather to discuss everything and nothing over hot tea, traveling abroad after college, first full-time “grown-up” job, moving to new cities, and the list goes on and on. It was during one of my visits to New York City that I first tasted matcha. A pastry school friend of mine was living in the city and was kind enough to take us to dinner in Koreatown. The night was full of fun catch-up conversation over the most amazing screaming-hot bibimbap. For dessert, we walked around the dark and humid New York City streets eating matcha popsicles from a local market. The happiness of that night is imprinted in my brain by that creamy matcha dessert. They were so good. Today, the word “matcha” is melded to the memory of that night. We all have these types of memories and thinking back on them brightens up our day. Recreating these flavors or meals in our own home takes us to a safe space of remembrance and ushers in even more new memories with new people. A way to keep the happiness flowing and passing it on to others. This NYC memory inspired me to recreate it in the form of a macaron. The result are these Matcha, Coconut and Strawberry Macarons. Something about matcha and coconut blended together is beautiful. The mild bitterness and sweetness of the green tea powder paired along with the rich creaminess of coconut makes for a exotic balance of flavors. The sweetness of the strawberry confiture adds a touch of upcoming spring. For this recipe, I made two separate batches of macaron shells. The first batch matcha and the second plain almond. Then, the opposite colored shells were paired together to create the two-toned look. This will give you more than enough macarons to eat, so be prepared to share them or store the extra in the freezer. 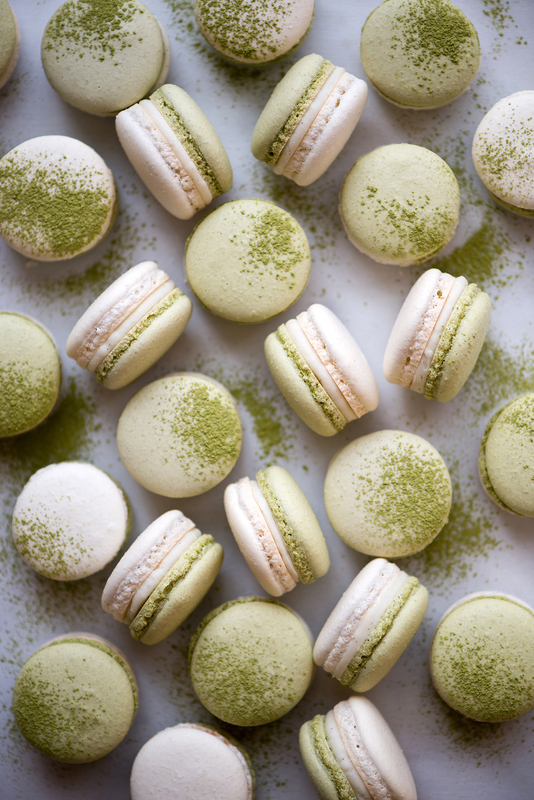 If you enjoy a stronger matcha flavor, skip the almond macaron shells and just make one batch of matcha shells (all green macarons). Also, it’s always important to remind you that the best tasting macarons are “cured” in the refrigerator for 24 hours. This resting period is what gives macarons their soft cake-like texture and infuses the shells with the filling’s flavor. Very important step for a great tasting macaron, so try not to skip it no matter how hard it may seem to wait. For more tips and notes on macaron-making visit my previous macaron posts, Earl Grey Cassis and Jasmine Apricot. Preheat oven to 325F (163C). Line a large sheet pan with parchment paper or a Silpat. Sift together the almond flour, confectioner’s sugar, and matcha in a medium sized bowl. Add the first portion of egg whites, but don’t stir. In a stand-mixer bowl, with a whip attachment, add the second portion of egg whites. In a small pot, bring the sugar and water to a boil until it reaches 244F (118C). Be careful not to splash any sugar-water on the sides of the pot to prevent crystallization. If you do, use a small pastry brush dipped in cold water to brush down the sides of the pot. When the syrup reaches 230F (110C), simultaneously begin whipping the second portion of egg whites to soft peaks. When the syrup reaches 244F (118C), in a gradual and steady stream pour the hot mixture into your whipping egg whites (set your mixer speed to medium-low and pour the syrup down the side of the bowl to keep it from being sprayed onto the sides of the bowl by the whip). Turn up the mixer speed to medium-high and allow the meringue to whip and cool down to at least 122F (50C) and the bottom of the mixer bowl is no longer hot to the touch. Meanwhile, combine the first portion of egg whites with the almond flour, confectioner’s sugar, and matcha. Fold the cooled meringue into the almond-sugar mixture in three additions. Add the first third and fold it in to loosen the almond-sugar mix. No need to be gentle at this stage as you want to fully incorporate it so that it’s easier to fold in the remaining meringue. Add the second third, this time folding gently, until there are no white meringue streaks. Add the last third, folding gently, until there are no white meringue streaks. Now, check the consistency of your macaron batter. You want a glossy batter that resembles slightly runny cake batter. It should flow down nicely and with few breaks from your spatula when you hold it up high over the bowl. When the batter falls into the bowl, it should smoothly flow back into the batter in a matter of seconds. If it doesn’t, simply give it a few more gentle folds and recheck your batter. Slowly, keep doing this until you reach the desired consistency. 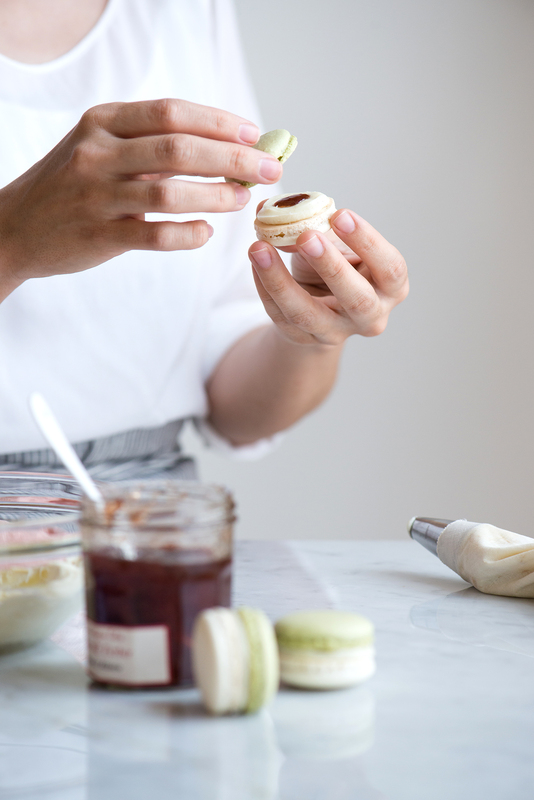 Prepare a large piping bag, fitted with a small plain round tip, and pour in the macaron batter. Hold the piping bag vertically and begin piping 3/4″ to 1″ round shells onto the lined sheet pan, spacing them about 1/2″ apart. Once you have piped an entire tray, lift up the tray and rap it lightly on the work surface. This act will remove any air bubbles and help prevent them from bursting in the oven. Set aside for 20-30 minutes to allow a skin to form on the surface. The batter should not stick to your finger when lightly touched. Bake for 12 minutes, until the tops are set and don’t wiggle when gently prodded. Remove from the oven and set on a cooling wrack to cool. Once both matcha and almond macaron shells are cooled, gently peel them off their sheet pans and pair up the matching sizes (one matcha shell and one almond shell for the two-toned macaron). *Aged egg whites are used in this recipe, in order to allow the whites to liquefy and lose their elasticity (the break down of their albumen protein). 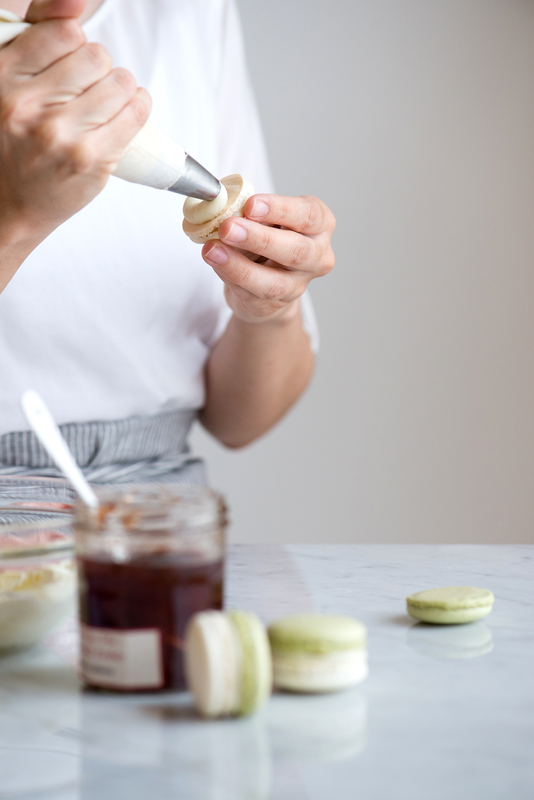 They become easier to whip to soft peaks and improve the texture of the macaron. If you don’t age the egg whites, don’t fret. Go ahead and use same-day separated whites, at room temperature. 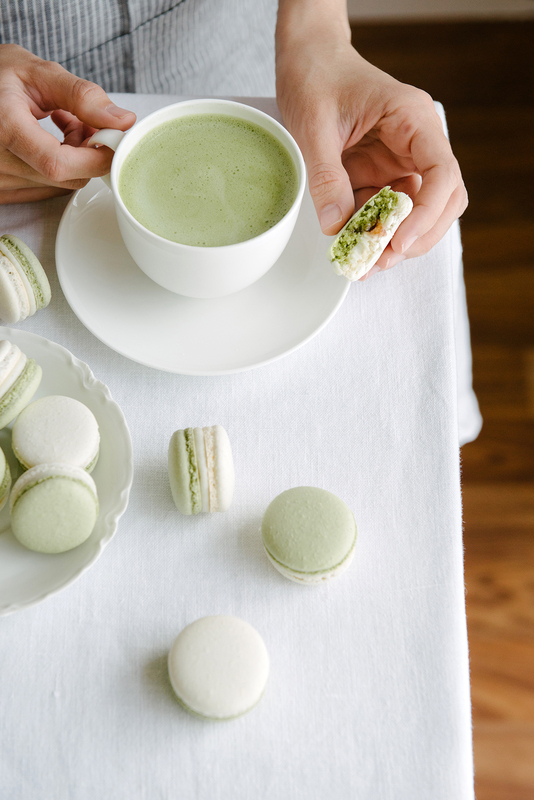 Follow the same instructions for the matcha macaron shells above. Macaron shell recipes adapted from Pierre Herme, Macarons. Melt your white chocolate in a small heat-proof bowl set over a small pot of simmering water (double boiler). Remove the bowl from pot when melted. Wipe any water off the bottom of the bowl carefully. Don’t allow any water to touch the chocolate or it’ll seize up. In a small saucepan, add the coconut cream, salt, and vanilla bean seeds. Bring to a simmer. Pour hot coconut cream mixture over the melted chocolate. Using an immersion blender, combine the two. You may also use a spatula or spoon to combine the mixture, starting with small circles in the center and working your way out to the sides of the bowl to create a smooth emulsion. The ganache will thicken, become shiny, and develop a pudding-like consistency. Add the butter in pieces and incorporate with the immersion blender or stir in thoroughly. Allow the ganache to cool and crystallize until the consistency is able to hold its shape, up to two hours or overnight. Place ganache into a piping bag fitted with small round tip or snip off the tip of the bag (if not using a piping tip). Place strawberry confiture into a piping bag and snip off the tip. Pipe a ring of ganache around the edge of an almond macaron shell and then pipe the confiture into the small gap in the center. Place on the matcha paired-up “top” to the macaron, pressing gently until the filling reaches the edge of the macaron. Repeat process until all macarons are filled. Place the filled macarons side by side on a tray, cover with plastic wrap, and refrigerate for 24 hours before serving. Remove them from the refrigerator at least two hours before serving to be enjoyed at the ideal temperature and best texture. **For the coconut cream: You can use a can of coconut milk to obtain the cream (the cream naturally separates itself from the liquid milk). Open the can and scrape off the firm cream from the top (save the coconut milk liquid for other uses). Tip: Placing the coconut milk can in the refrigerator for 20 minutes and then opening it makes it easier to scrape out the cream. Wow….you are an amazing pastry chef. Hi Eva! Thank you for such kind words. It’s wonderful to be able to connect with fellow bakers like yourself. Have a great weekend! YAY!!!! I was mentioned by default as I was co hostess for tea time in our dorm! Woot Woot! These macaroons look delectable! They ooze spring! Hey roomie! Yes! Those memories are dear to me. There’s no specific topic that I remember discussing, but all the laughing until our bellies hurt is what I remember. It was therapeutic and I’ll never forget it. Happy Weekend friend! this flavor combination sounds amazing! and food memories are my favorite too- they make the food even richer and more potent when combined with all of our experiences, even the sad ones. Hi Heather! So well said. Our memories do become more potent when tied to food whether happy or sad. It’s a beautiful experience. Reading your memory of Koreatown made me smile – isn’t hot bibimbap just the best?! And these macarons are magical!!! I’ve not made macarons yet but this post totally inspires me to change that! Erica, that hot bibimbap is imprinted on my brain! It was crazy good. Also, food usually tastes even better when you’re sharing it with friends. You should make macarons sometime. I think you’d like it. ;) Have a great week lovely! Hi Teresa, what type of thermometer do you use for this recipe? Hi Caroline, I recommend a candy thermometer (that clips on the side of the pan) or a long digital thermometer. It’s safer to use one that keeps you from having to hold your hand over the pot of hot boiling sugar syrup.